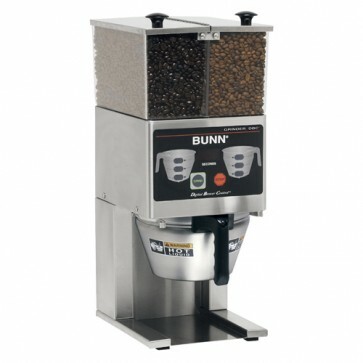 Have your French press and drip coffee too with BUNN's Digital French press Grinder. Featuring a multi-batch setting that allows the user to specify the amount of grounds needed. Select anywhere from a single French press to a more generous amount that will fill a large commercial funnel for drip style coffee. Two large bean hoppers hold up to 3 pounds of fresh coffee beans in each hopper for a whopping total of 6 pounds of beans! Commercial Burrs: Equipped with commercial precision burrs to cut (not crush!) coffee beans and provide consistency throughout the grind. Multi-Batch Setting: Grind just enough for a single French press or larger amounts for a big batch of drip-style coffee. Generous Cup Clearance: This grinder can accommodate up to an 8 inch tall French press or a large commercial funnel. Dual Hoppers: Store decaf in one and fully-loaded in the other! Either way, you're storing up to 6 pounds of whole coffee beans. Winning! Digital Touchpad: Easily program settings from the front of the machine with the digital touchpad and LCD read-out.